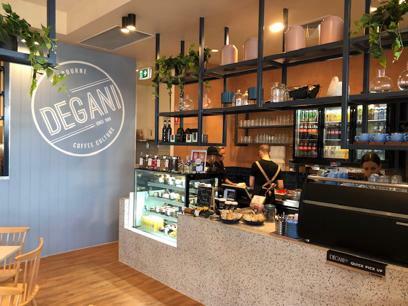 Born in the late 1990s, Degani quickly became a leader in Melbournes’ burgeoning cafe market, before strong interest from across the country led to national expansion. At the time of printing we have over 80 cafes, restaurants and kiosks (with more opening each month!) So why has this little café from Clifton Hill grown so much? Every Degani menu is unique, providing a locally tailored solution to amplify your profitability. You as a franchisee are the added element that connects with your community and makes your Degani unique. Every Degani is tailor built to be welcoming, on trend and attractive. You are in business for yourself, but not by yourself. We have the system to help you grow. The journey to becoming a Degani franchisee is deliberately detailed, as we are entering into a long term relationship based on mutual respect and trust. We both need to do our homework to ensure that our goals and values are aligned. This is just the first step and for some it may not go any further. But if this sounds like the right fit for you, we look forward to getting to know you and taking the next steps together. Degani is the affordable business opportunity, as we have designed our business model to attract the right franchise business partners to create success. We offer competitively priced franchise fees and royalties to assist our franchisees in reaching their goals. Our Franchise Business Model is engineered from intimate industry knowledge. This has enabled us to compile simply structured operational guidelines and tailored marketing initiatives to help you to continually grow your business. The relationship with your dedicated Business Development Manager allows for coaching and growth strategies to be developed and implemented. This makes doing business with Degani a true partnership based on mutual respect, recognition & understanding. Do you think you have what it takes to join the Degani brand and be apart of the coffee culture revolution? “The perfect cup of coffee in a great atmosphere – that, in a nutshell, is the appeal of Degani and the secret to our continued success. From that first small bakery café in Clifton Hill in 1999, Degani has evolved into a brand synonymous with quality, comfort and a consistently high level of customer service. Growth has occurred organically. It started with customers going out of their way to buy a takeaway coffee or freshly baked vanilla slice or fruit bun, and word spread. We were clearly doing something right. In no time, business minded people were coming to us – passionate coffee drinkers – who had noticed the influx of customers in our stores and wanted to know how they could join the Degani family, and be part of our success story. These same people knew that by trading under the Degani name they could not only prosper but retain a sense of their own individuality as entrepreneurs and active members of their local communities. That’s why our stores have always retained the allure of one-off independents, a phenomenon integral to Melbourne’s café culture. “I have been the proud owner of Degani Northcote since December 2011. Prior to opening my business I was a longtime waitress at another exceptional Degani store at University Hill, Bundoora, and it was there that I gained a lot of knowledge, experience and a real feel for Degani. To me, Degani is not just a brand – it’s a world of possibilities, a culture, a lifestyle and most importantly, a family. We are proud to provide the highest level of customer service. We offer great coffee and fresh meals using only the finest ingredients. If I won’t eat it, I won’t serve it. This has made a huge impact on the success of the business. Opening a business of this calibre at the age of 26 was a huge step for me, and took courage, but I believed in myself, my skills and knew deep down I could do it. I took the risk and went all the way. It took hard work – days, nights, weekends, double shifts, but the sacrifices have more than paid off. I have created a business that is renowned in the northern suburbs of Victoria. Since we opened two and a half years ago, turnover has more than doubled and in the summer months increases by a further 20 or 30 per cent. This rapid growth has also led to sizeable staffing increases, from 14 to the current team of 52.